DETAILED PHOTOS TO BE ADDED! 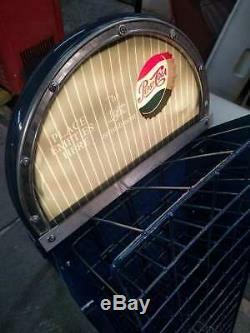 This is a Post war 1950s Jacobs model 56 Pepsi Cola Selectivend soda machine. Jacobs produced two machines for Pepsi Cola in the early 1950s. Jacobs machines have a unique shape refered to by collectors as the "mailbox" shape. About 1953 Pepsi Cola adopted a new sales pitch to better target young, fashionable consumers with the theme " Be sociable HAVE A PEPSI". "The light refreshment" phrase was also adopted by Pepsi to reflect America's weight - less sugar than other soda choices. In the 1950s, Pepsi Cola maintained their own refurbishment shops. This allowed Pepsi to update on hand / in warehouse soda machines with the newest and the latest graphics - colors - and themes. Refurbished soda machines had a second life of service in the field, looking new and fresh and marketing Pepsi to new target audiences. In the 1950s the trend among soda machines was to offer vendors with multiple flavor selections. The Selectivend Corporation introduced conversion kits for one flavor soda machines. Conversion kits changed a single-selection machine to a multivendor selectomatic vending machine - now able to dispense different flavors like Mountain Dew and Dr Pepper. These converted machines are rare today. 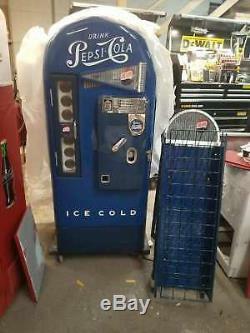 This Pepsi Cola Selectivend machine will vend small bottles and large bottles of glass and plastic up to 16.9 oz soda. When a coin is deposited and the crank handle is pushed, a point of sell light on the coin door illuminates "HAVE A PEPSI". This light encourages the customer to select a Pepsi. When the bottle is removed from the 7 flavor bottle stack, the light will go out. The front of this machine illuminates "THE LIGHT REFRESHMENT". The lighting system on this machine is now upgraded to rotate colors or it can stay white - you select from a remote control. This machine holds 56 bottles and will vend 7 different flavors of product. The shelves adjust for bottle size and will accommodate long neck beer, plastic 16.9oz half liter soda and water as well. This is the ultimate restored antique soda machine. It has everything - perfect size ; shape ; crank handle ; multiflavor ; point of sale light ; embossed ; custom graphics ; high capacity commercial cooling system ; lighted vintage sign with rotating color scheme ; all vintage restored parts with selectivend vintage kit and updated factory correct reproduction parts from funtronics. The 1950s Jacobs 56 is by far the best looking Pepsi machine ever made and it commands the big bucks, however its drawbacks are that it vends one flavor, has no embossing, only vends one size bottle. The Selectivend conversion kit installed in this Jacobs machine elevates this Jacobs machine to BEST IN THE WORLD - SUPERSTAR STATUS - allowing you to use this antique Pepsi machine and not just look at it. These machines came from Jacobs with decals and or plastic caps. Extra work was put into this original machine to recreate the Pepsi Cola embossing correct for the time rather than leave it flat or use a cheap decal. This is a real antique soda machine from 1952. It is not a reproduction. The mechanics / insides are also all vintage and are not reproduction parts. Inside parts were restored and Funtronics parts were used where applicable. A LOT OF TIME AND WORK WAS PUT INTO THIS RESTORED PEPSI MACHINE. Both the machine and the rack have matching blue, yellow, and gray lighted signs that are interchangeable. Thanks so much for looking. Dimensions of this machine measured to 25" wide by 25" deep by 62 high. The item "Pepsi cola Jacobs 56 Vendo Selectivend Coca Coke soda machine lighted sign rack" is in sale since Monday, January 28, 2019. This item is in the category "Collectibles\Banks, Registers & Vending\Vending Machines\Soda". The seller is "carolinaclassics" and is located in Rutherford College, North Carolina. This item can be shipped to United States.